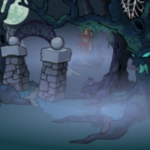 Neopia's Haunted Woods is one of the scariest yet magical of all the Neopian lands. While you are there, beware! There are many monsters and ghouls lurking around. You may even be asked by the Brain Tree to fetch some nasty food items. What? No! Do not turn back! There is so much more to discover. If all that scary stuff is not really for you, try going to the Deserted Fairground. Okay, it really is not as bad as it sounds. It is actually pretty fun. Sure, some of the games are rigged, but what are you going to do? Test your strength or try your luck at Bagatelle to win lot of fun prizes! Feel like throwing more things? Have a go at Coconut Shy and try to knock the coconut off its peg. If you are hungry, head over to Spooky Foods and try a... erm... delectable snack? Sure, we will say delectable. Okay, you are probably pretty scared right now; there are a few sets of eyes that seem to be following you. You should probably head over to Haunted Weaponry and pick up something to keep you company. Alright! Now that you are equipped with your Scythe of Eternal Darkness, it is time for some fun and games. The Haunted Woods offers a variety of fun (non-rigged) games for you to play. Let us head on over to play Carnival of Terror! Shoot the robot-clown Chias to gain points, but be wary, you have limited time and ammo, so make the best of it. By now, I think you know where this is going, Neopian Fashions Part Four: Haunted Woods is all about looking your spookiest. So off we go! Into the dark realms and inevitable doom of Haunted Woods fashion! Oh, another thing, you may want to keep that Scythe of Eternal Darkness with you. Very close to you, and be prepared to use it at any time. If you want to make an entrance, this background is the one for you! 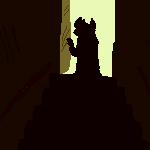 Modeled to the smallest detail after the actual entrance to the Haunted Woods, this background is well worth the neopoints and makes any look spooky. A much cheaper alternative, this background is also modeled after an infamous castle located in the Haunted Woods. This background is best for formal occasions. Maybe you will be invited to a masquerade? Or maybe you just have a thing for Nox. Either way, this background is not too expensive and can be used for many different looks. The detailing on this ink frame is simply exquisite and can make a cheesy homemade costume look classy and sophisticated. This frame was made with only the finest ink exported from the Lost Desert. A tad expensive for a frame, but it is a definite must-have and can be used for any outfit, even if it is not Haunted Woods themed. A Brown Coat Suit, just what every Neopian needs. This simple coat goes with everything and it sure to keep you warm on those chilly Haunted Woods nights. Made with the finest non-leather product money can buy. This is another great item, Hanso's Thief Jacket. Equipped with many pockets, you can carry around all your winnings from the Deserted Fairground, that is, if you managed to win anything. If not, you can easily camouflage your Scythe of Eternal Darkness inside your jacket. Another thing you cannot go wrong with, masks! They range from very cheap to a tad pricey, but whatever your budget is, there is a mask for you! What's creepier than specialised contacts? Um... nothing! These are sure to scare the socks off any Neopians that sees you. Words of advice, if you cherish your socks, do not look in a mirror. You can never go wrong with a scary costume in the Haunted Woods. Why? It is Halloween all year round! It is relatively cheap so show your appreciation for all things gross and spooky with this Giant Moach Costume today! Cheap accessories; our best friend! Make any outfit just a little bit more awesome with these spooky accent pieces. 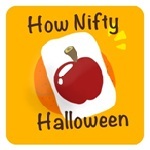 They grab the attention of anyone near you and could mean the difference between winning and losing a costume contest. Whether your budget is 1,000 neopoints or 1,000,000 neopoints, there is a wig for you. Wigs are a great way to add personality to an outfit or costume and they definitely give you bonus points in the fashion world. Okay, so super spooky is not exactly for everyone, which is understandable. So here is a not-so-spooky Neovian background. It is sure to go with any dark outfit you wear, and do not fret, just because is is not overly scary, does not mean you will not be let into the Haunted Woods. What is better than thousands of little bugs flying around you? Absolutely nothing. Okay, I am exaggerating a little bit, but still. This background goes with any outfit AND comes with a million little minions to follow you around. Minions are the first step to being awesome. But seriously, those things are scary. Creep out your friends and family with this deranged little petpet munching away at your background. Just do not wear it for too long, you could disappear! Want to show off your inner darkness, but just do not quite know how? Try this superpack! It consists of a Dark Princess Tiara, Gown, Shoes, fan and Wings. You are sure to knock the socks off your friends and family. Going for a more fun look? Then this superpack is for you. It contains Mad Tea Party Background, Mad Tea Party Hat, Mad Tea Party Jacket, Mad Tea Party Shoes, Mad Tea Party Stacks of Cups and Pots, Trousers, and a Mad Tea Party Teapot. Wigs are a fantastic way to make an outfit a bit scarier. When choosing a wig, particularly for the Haunted Woods, be original! Choose wacky colours and pair it with something you would not normally wear. Sometimes the worst fashion sense is the best. Want to stand out among your friends? Be bold and try some face paint! While it may seem a bit off limits, face paint can really improve a look by adding originality and it is definitely encouraged in the land of Haunted Woods. An essential to all Haunted Woods wardrobes. These stockings and shoes can be worn with everything. Even if you cannot see them, they are sure to keep your legs warm while adventuring the Game Graveyard, perhaps? After visiting the Haunted Woods, you are going to love it so much. So why not bring a bit home with you? You can design your room to be as scary as your heart desires with Haunted Woods Tree Lamp, Sculpted Haunted Woods Sofa, Spooky Haunted Woods Bed, Wooden Haunted Woods Desk, Haunted Woods Brain Tree Floor Tiles, and Haunted Woods Spooky Tree Wallpaper. With these ideas in mind you are sure to be successful in the Haunted Woods world of fashion! You now know how to make super spooky outfits with both Neopoint and Neocash items! 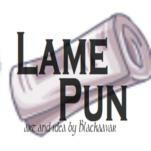 I hope you enjoyed this and thank you for reading Neopian Fashion Part Four: Haunted Woods.